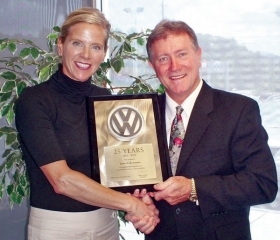 Kristina Serra of Serra Volkswagen in Birmingham, Ala., receives a 25-year award for Volkswagen from Larry Daniel, Volkswagen of America's sales operations manager. Members of the Chicago Automobile Trade Association elected officers. 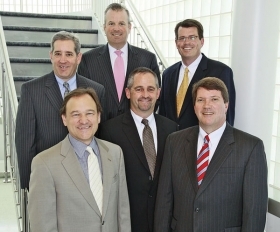 In the front row, from left, are Kevin Mize of O'Hare Honda and O'Hare Hyundai in Des Plaines, Ill., 2011 Chicago Auto Show chairman; Kurt Schiele of Elmhurst BMW, Jaguar Elmhurst and Elmhurst Toyota-Scion in Elmhurst, treasurer; and Steve Foley Jr. of Steve Foley Cadillac-Bentley and Rolls-Royce in Northbrook, the association's chairman. In the back row, from left, are Mike Ettleson of Ettleson Cadillac-Buick-GMC and Ettleson Hyundai in Hodgkins, vice chairman; John Webb of Packey Webb Ford in Downers Grove, secretary; and Dave Sloan, the association's president. 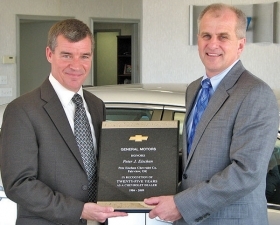 Pete Eischen, left, of Pete Eischen Chevrolet in Fairview, Okla., receives a 25-year award for Chevrolet from Brad Nelson, Chevrolet's zone manager for the south central region. 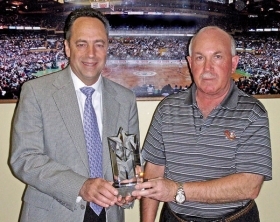 Jack Fox, right, of Fox Toyota in East Providence, R.I., receives a 25-year award for Toyota from Chris Cento, general manager of Toyota Motor Sales U.S.A.'s Boston region. 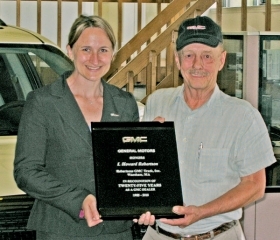 Howard Robertson of Robertsons GMC in Wareham, Mass., receives a 25-year award for GMC from Tamera Jackson, Buick-GMC's New England zone manager.